The term “cycloplegic refraction” certainly sounds intimidating. Tell this to a child and it can be understandably frightening. As with many unknowns, a little knowledge and setting expectations can take away unnecessary fears. Cycloplegic refraction is nothing more than a procedure used by eye doctors to gain an accurate reading of a person’s refractive error to help them see more clearly and comfortably. Refractive error is the inability of a person’s eye to bend light correctly. If light is not refracted properly as it enters the eye, the result is distorted vision. During the testing in an eye exam, a patient’s eyes may auto- focus, or accommodate, which leads to inaccurate and inconclusive testing results. When your eyes are auto focusing, your eye doctor cannot decisively determine your true eye prescription. Cycloplegic refraction temporarily stops the eye’s ability to auto focus allowing your eye doctor to correctly ascertain your prescription and optimize your ability to see clearly and comfortably. Why is Cycloplegic Refraction Common with Children? Cycloplegic refraction is often times used with children. Children have a strong ability to unknowingly accommodate, or auto-focus, their vision which makes eye exams yield inaccurate or incomplete results. As described above, cycloplegic refraction briefly suspends a child’s ability to auto-focus. 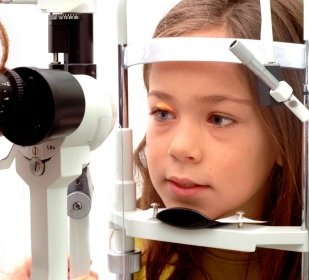 This provides the eye doctor with an uninterrupted opportunity to obtain an exact reading on the child’s refractive error and derive a true and accurate prescription. Cycloplegic eye drops are placed in the patient’s eye to prevent the ciliary muscle of the eye from contracting and relaxing. This muscle is attached to the crystalline lens of the eye and controls the shape of lens. There are a variety of cycloplegic eye drops which differ in strength and duration. When these eye drops are applied, it causes the pupils to dilate and vision will become blurred for a few hours. Some patients also experience tearing and redness in the eyes. Cycloplegic refraction is not exclusively for children. Adults sometimes need this procedure performed to gain a more precise eye prescription. If eyeglasses do not provide the level of clarity needed, this procedure may be appropriate to deliver a refined eyeglass prescription. Learn more about quality eye care and eye wear from a company and a team of eye care professionals who have been providing a superior level of service for more than 30 years. Please visit www.shawneeoptical.com.